Obviously the first question that needs to be asked is whether you are a seller or a buyer, as your intentions, and the spending budget and scope of any remodeling you will be doing is vastly different for the same property. Today I am going to focus on the seller. 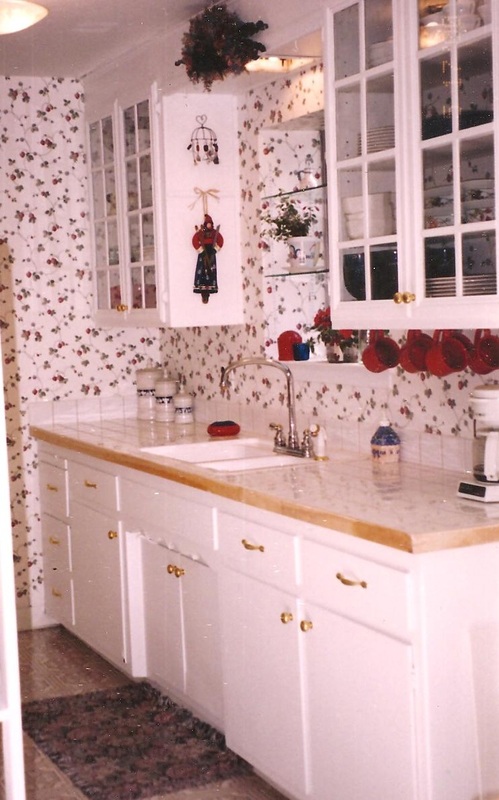 As the seller of an average home, your intention, if the kitchen is old and dated, is to make it appear less so. This preferably involves cosmetic changes that gives the place a bit of an updated ‘facelift’ without spending a lot of money on it. Certainly as a seller, the materials selection are different as well as the budget for such a project – as opposed to a home YOU personally intend to live in for awhile. Before photo. Old cabinets with worn out finish, chipped and dated laminate countertop. Inexpensive kitchen facelift. Cabinets painted white, new hardware, stock white tile, 4 glass doors, wallpaper, clearance faucet and stock home center sink. The article lays out 6 different kitchen projects that can ratchet up the appeal and/or value factor to a kitchen. The following are suggestions as to how a home seller can adapt the article’s design principles to appeal to a home buyer without breaking the bank. If you’re a home seller, this option comes more under the category of ‘fuhgeddaboudit’. Both new cabinetry and refacing will require a healthy chunk of change that would be more appropriate for the home buyer to be investing in. That being said, there are inexpensive things you can do to spruce up tired and outdated cabinetry to be more appealing. Start with a good cleaning. Most kitchens build up a phenomenal amount of grease and grime over the years, and tackling the inevitable buildup will at the very least give a home buyer the impression of cleanliness if nothing else. After you’ve cut down on the crud factor, you now have a clean canvas to start with to consider some other options. Stain. I’m a big fan of the Zar family of products. With a ‘two-fer’ of stain and sealer combined, it’s just the ticket to add a nice sheen and freshen up the finish on old, scratched cabinetry. You can also use the same product to ‘glaze’ your cabinets, which is applying more stain to the creases and crevasses of the cabinet doors and drawers, wiping it off gently, allowing the excess to linger in the depressions. A basic cabinet door will have more visual interest and definition by doing this – or you can also use this technique to create an old world look. Realize this IS a temporary, cosmetic fix. You will be staining the existing finish, not the wood itself. It is not intended to hold up for long term use, although a coat of varnish over it would make it longer lasting. Remember, you’re not aiming for new cabinet perfection here. 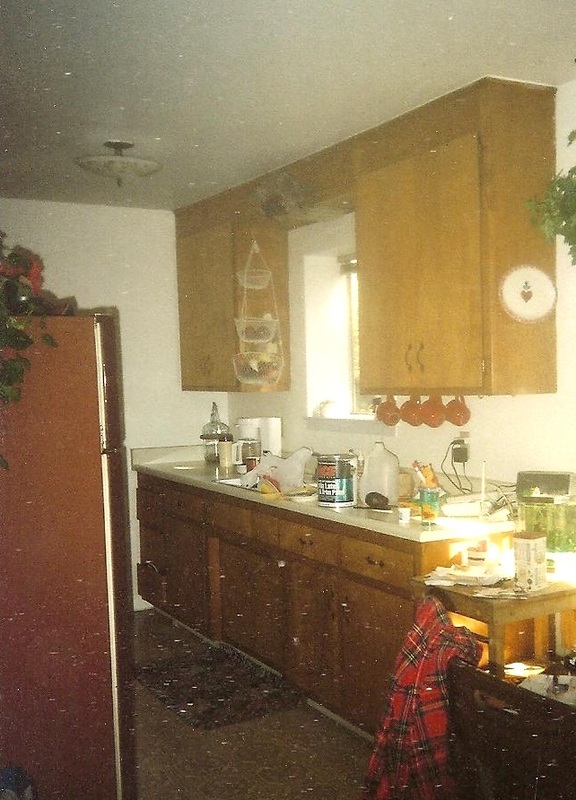 You’re just trying to make the kitchen seem freshened up to a potential buyer, not remodeling it for them. Paint. It’s a wonderful and inexpensive way to salvage run down cabinets that have been abused beyond all redemption. At least any redemption that can be fixed with stain. Consider sage greens, antiqued black or brick red for an updated mountain feel. Glazed and painted cabinetry are popular (and more expensive) options in most manufactured cabinetry lines. If you have any DIY abilities whatsoever, you can mimic the look on your old cabinets for pennies on the dollar compared to new cabinets. And never underestimate the power of a fresh coat of paint and color on your walls. Sand beiges are still appealing neutral colors while adding a touch of elegance. Boring (and often dirty) white walls just makes the house you would like to sell for a pretty penny look like a low rent apartment.